Shirts With Random Triangles: Joker Phillips is an ex-Florida wide receivers coach (UPDATED). 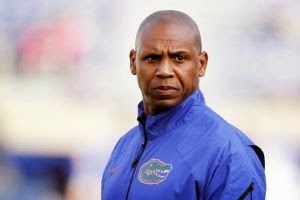 In a statement, Phillips said that he was "thankful for the opportunity that the University of Florida and Will Muschamp provided to me and my family, but at this time I have decided to step down from my position on the UF coaching staff for personal reasons,"
ESPN's Brent Murphy is reporting via sources that Phillips was forced out due to possible recruiting violations. No further information was regarding the allegation. McMurphy has retracted his allegations on Twitter. Phillips came to Florida in 2012 following three years as head coach at Kentucky.